Florida manatee, Trichechus manatus latirostris, a subspecies of the West Indian manatee, endangered. 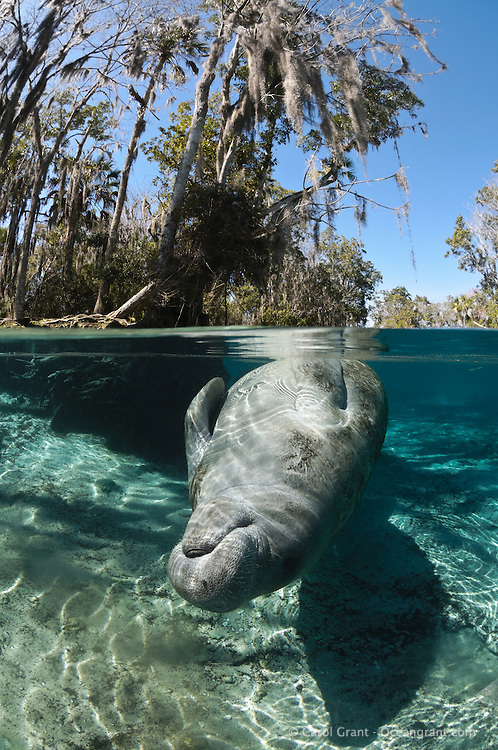 An adult female manatee relaxes and rolls in the warm shallow waters that rim the springs. Tranquil and undisturbed behavior. Vertical orientation split image with clear water and warming sun rays. Three Sisters Springs, Crystal River National Wildlife Refuge, Kings Bay, Crystal River, Citrus County, Florida USA.